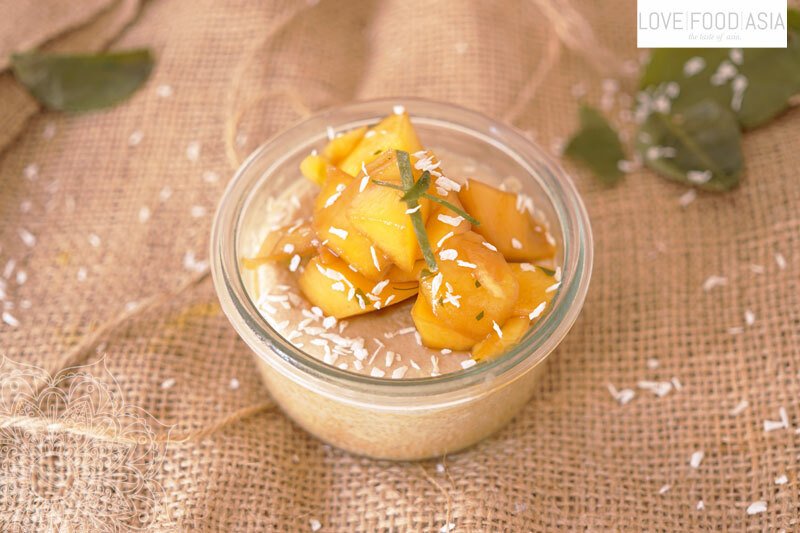 This coconut and mango custard is a delicious Thai treat and a terrific way to enjoy fresh mangos while they’re in season. Makes a great dessert any day of the week, and you can whip it up and have it in the oven in just 15 minutes. We like it served warm but if the weather is hot it’s also delicious straight from the refrigerator. Excellent as a dessert, with tea as an afternoon snack or with coffee at breakfast. Use a balloon whisk to whisk together coconut cream, thickened cream, eggs and combined sugar in a large bowl. Strain cream mixture into a large jug. Pour evenly among six 125 ml capacity ramekins or Asian-style teacups. Place a large bamboo steamer over a wok one-third filled with water and bring to the boil (make sure the base of the steamer doesn’t touch the water). Place the ramekins or teacups in the steamer and cover with a large piece of non-stick baking paper. Cook, covered, for 12-15 minutes or until the custard is just set. Remove from steamer and set aside to cool. Place mango, lime leaves and extra brown sugar in a bowl and stir until the sugar dissolves. Top custards with mango mixture to serve.